Egg whites are 90 percent water and 10 percent protein. Both egg yolks and egg whites have their own set of benefits and nutrients that are good for the body, but in a general sense, expert nutritionists can say that egg whites are the healthier part of the egg compared to the yolk. If you’re on a diet, eating egg whites can be beneficial for you, because the whites on a single egg can already make you feel full, as they are rich in protein. Also, they contain no cholesterol and saturated fats and have very little calories (17 calories). Egg whites are a healthy choice for people who are trying to cut back on their cholesterol intake and lower their body mass index and waist circumference. Practice eating them in the morning instead of your morning cereal, which is full of sugar, anyway. A high-protein meal can slow down insulin responses by lowering the energy requirement in the next meal, prompting the body to eat less. Egg whites aid in the anti-aging process; the acetylcholine inside them prevents cross-linking of proteins which results in the tearing of muscles and which can cause aging. Egg whites are good for maintainng membrane potential, which is essential for nerve impulse transmission, proper heart function, muscle contraction, and the systemic transfer of nutrients and metabolites throughout cells. Riboflavin, or vitamin B2, is needed by the body to guard against certain conditions like eye cataracts, hyperhomocysteinemia (or the oversupply of homocysteine in the blood that can lead to atherosclerosis and blood clots), and migraine headaches. An egg white has 54 milligrams of potassium, which contributes to heart, bone, cell, and over-all organ health. 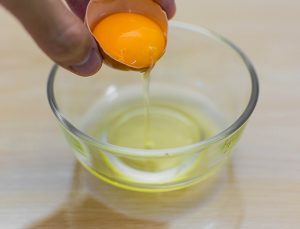 Egg whites can be mixed and incorporated into face masks, as they have properties that have been proven effective when it comes to addressing wrinkles, acne, pimples, blemishes, and scarring. They have proteins that aid in the absorption of extra oil in the body, so people with oily skin would benefit a lot from washing their faces with egg whites. Remember to beat the egg whites thoroughly to maximize their skin cleansing potentials. Their effect is temporary, so you might want to postpone your egg white-face washing until your next big event. Of course egg whites can be eaten, and are in fact delicious snacks. They are used to make lemon curd, mayonnaise, and ice cream bases. They can make dishes such as fresh pasta, butterscotch pudding, or homemade challah taste flavorful and rich. Here are other ways to enjoy egg whites. Egg whites contain no cholesterol and saturated fats and have very little calories. Egg whites aid in the anti-aging process as the acetylcholine inside them prevents cross-linking of proteins.